The popular 1947 novel Whisky Galore is in some ways inferior to its film adaptation – complacent, conformist, slackly plotted and not exactly side-splitting. The above quotation features a character and subplot eliminated from the film – Mr. Brown is, in fact, Lieutenant Boggust of the Security Intelligence Corps, sent to investigate defeatism and careless talk in the two northern Scottish islands of Todday. But this paragraph also hints at a variety of tensions elided by the film of Whisky Galore! – among others, those of religion, class, nationality (and gender) – that threaten to disturb the smug surface of Compton MacKenzie’s book (2). The story in each work is broadly the same: at the height of World War II, rationing has led to a drought of whisky in Todday, dangerously weakening morale. By good fortune (or deus ex machina, if you prefer), a merchant ship carrying a cargo of Scotch runs aground nearby; the crates are quickly retrieved by parched natives, to the annoyance of English Home Guard commander, Captain Waggett (Basil Radford). Whisky Galore! is a classic piece of Scottish moonshine written by an Englishman and directed by a Scotsman born in America, and a typical film of its era. It is part of a series of films (e.g. I Know Where I’m Going! [Michael Powell and Emeric Pressburger, 1945], The Quiet Man [John Ford, 1952] and Brigadoon [Vincente Minnelli, 1954]) released in the decade after the war set in Celtic locales that were a far cry from the Blitz-wrecked urban centres featured in wartime newsreels. In its comic, uncontentious way, the film offers a kind of “revision” of the war (like The Third Man [Carol Reed, 1949] or La Traversée de Paris [Claude Autant-Lara, 1956]), parodying the community values and plucky resistance to moustachioed demagoguery that had been extolled in those same newsreels (and films) only a few years previously. In the same way, Whisky Galore! is an archetypal Ealing comedy, along the lines of Passport to Pimlico (Henry Cornelius, 1949) and The Titfield Thunderbolt (Charles Crichton, 1953), celebrating communal defiance of oppressive bureaucracy (3). 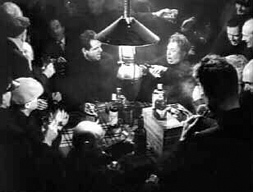 The film also draws on a long tradition of works about smuggling (e.g. John Meade Falkner’s, Moonfleet, 1909, and Daphne du Maurier’s Jamaica Inn, 1936), in particular Will Hay’s comic masterpiece Oh, Mr. Porter! (Marcel Varnel, 1937), a kind of precursor to Whisky Galore! with its clash between English officialdom and Gaelic natives. It is also the first Alexander Mackendrick film, and already we can see in evidence some of the themes and modes that would flower in his greatest works, The Ladykillers (1955) and Sweet Smell of Success (1957): an interest in different levels of time (official, social, natural and emotional); the use of music as (often ironic) commentary; an analysis of communication media, and the various barriers (social, linguistic, etc.) to its successful use. Both book and film are essentially social works, whose main characters are the community involved, rather than any one exceptional individual. Each work’s entry into this community, however, is significantly different. MacKenzie bookends his narrative with the English soldier Sergeant Odd and the resolution of a marriage plot – this serves to “normalise” the story for the presumed English audience, allowing them access to this comic world through a representative “guide” figure, who must work out its quirks and secrets from a similarly ignorant vantage point. Mackendrick begins by parodying the Griersonian documentary, as a Scottish narrator introduces the film’s locale (4). This might seem to be an equally distancing device, in the sense of distancing the “normal” viewer from the wacky natives, but it turns out that the narrator, traditionally the “voice of God”, is one of “them”, full of insider knowledge and sly jokes, eventually getting as drunk as they do. This use of the documentary form performs a number of functions; most importantly, it grounds the narrative, making its move into magic realism more plausible. Mackendrick expands on one of the book’s main themes to etch a characteristic study of emasculation. Whisky Galore! depicts a world where the “real” men have gone off to fight in the war, leaving behind simple, infirm, elderly or emotionally feeble males, represented by a ragged Home Guard that surely influenced David Croft and Jimmy Perry when they created Dad’s Army (1968–77). It is strange that in wartime there are so few women on the island, as if it is they who have gone off to fight, leaving behind a “feminised” patriarchy (one female character says, “Just as soft as dough, that’s what men are” (5)). In such a world, whisky (from the Gaelic, meaning “water of life”) functions as a kind of restorative magic potion, much like that in the Asterix comics (books which also tried to replace the Fall of France with the myth of a heroic Resistance (6)). Goscinny and Uderzo’s potion was reserved for the men, and the sense of triumph in Mackendrick’s film, when the locals swipe crates of whisky from under the nose of Captain Waggett, is undermined by a montage that shows its benefits as being solely for the men. So emasculated are they that their targets of authority must be ridiculously feminised – the dragon mother (Jean Cadell) who won’t let her 35-year-old schoolmaster son (Gordon Jackson) marry, and locks him in his bedroom with a Bible as punishment; the treacherous bar owner (James Woodburn) who is more interested in profit than civic goodwill; and the irritatingly officious Captain Waggett, whose outsider status as a Sassenach (the Gaelic world for Englishman, literally meaning “outsider”) means he can never be considered a “manly” man. If we shift the social focus of the film slightly, and ask who the main character might be, then it is surely this same Waggett, whose role is expanded from that in the book. Basil Radford was famous for the series of silly asses he played with Naunton Wayne in films such as The Lady Vanishes (1938, Alfred Hitchcock) and Dead of Night (1945, the golfing story, directed by Charles Crichton), but in the same year as Whisky Galore!, he played an archetypal English civil servant in Passport to Pimlico. Waggett is the role of his career, and both Radford and Mackendrick skilfully manoeuvre the character from the caricature of a laird lording over the natives to something almost – mind, I say almost – resembling a tragic hero. He is in the tradition of such Mackendrickian anti-heroes as Sidney Stratton in The Man in the White Suit (1951) and Professor Marcus in The Ladykillers (1955), each of whom is foiled by faulty planning, communal hostility, adverse circumstances and an unfounded sense of their own self-worth. Mackendrick (with scriptwriters MacKenzie and Angus MacPhail), tighten the plot by conflating characters and telescoping events (adding a race-against-time climax to the smuggling plot), making it more exciting and dynamic, by essentially fleshing out Georges Méliès’ famous Le Tripot clandestin (1905), in which a community of illegal pleasure seekers (gamblers) contrive to hoodwink killjoy authority with deceptive appearances. But Mackendrick also replaces the Shakespearean marriage that ends the book, all resolution and reconciliation, with something much more open, something that, after an often flippant comedy based on human error, affirms, as in Michael Powell’s The Edge of the World (1937), the mysteries of nature. Compton MacKenzie, Whisky Galore, Vintage, London, 2004, p. 117. The book’s two Todday islands, one Protestant, one Catholic, become a single unit in the film; both religious leaders are edited out; and the “religious” properties of the whisky are downplayed. Both book and film were products of a Labour administration still enforcing strict rationing long after the war, so that contemporary readers and viewers felt the same sense of want as the fictional characters. MacKenzie also lampoons the documentary form, with long passages “quoted” from Hector Hamish Mackay’s faux topographical travelogue, Faerie Lands Forlorn, a work conflating scientific observation and supernatural romanticism. Of course, Britain didn’t lose the war, but it was losing its Empire – India became independent the year the novel was published; both book and film, to be po-faced, are set in a peripheral colony which the English fail to control. For more on Mackendrick and Empire, see Philip Kemp, “Satire with Tweezers”, Sight and Sound vol. 14, no. 7, July 2004, pp. 22–26.